The aisle runner originated as a barrier to protect the bride from evil spirits as she made her way down the aisle. It continued to be used to protect the bride’s dress as she walked down the aisle and nowadays, most often as a special way to announce the bride’s entrance. 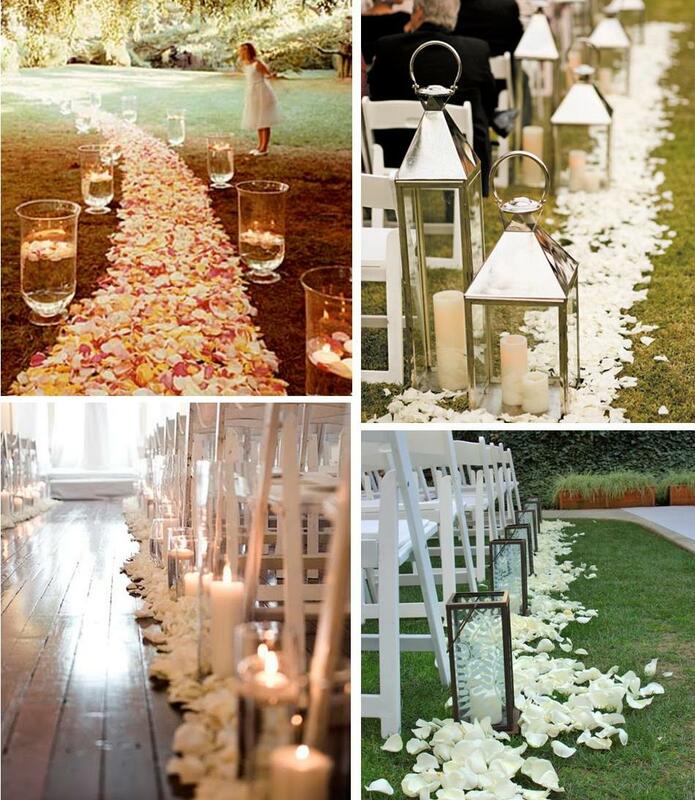 Even non-traditional brides like the tradition of an aisle runner, but it is completely optional in your wedding! There is no right or wrong way to display your runner, but common practice is to reserve it for the bridal party or just the bride. 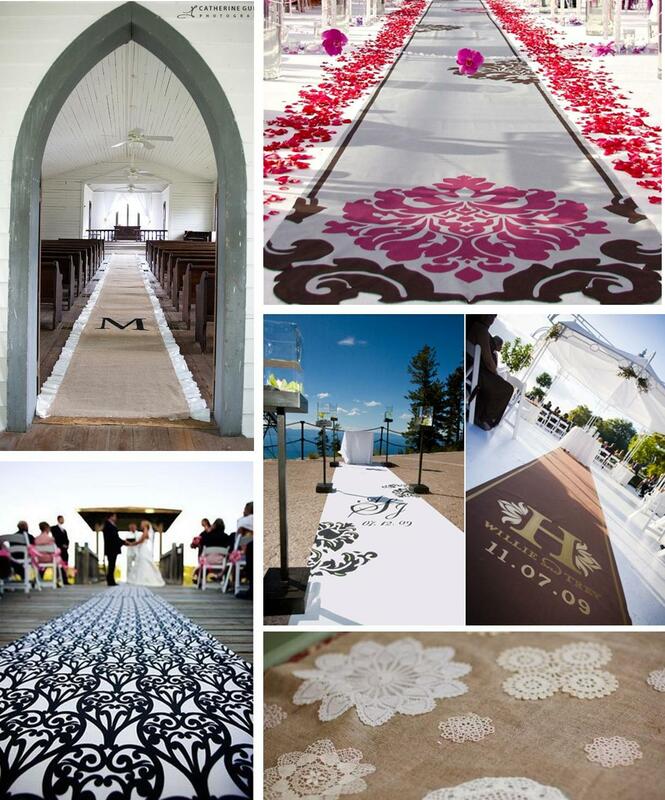 Aisle runners may have started out as paper, but they have come a long way! Whether you want a traditional aisle runner or something more unique, we compiled aisle runner ideas for all types of weddings and all types of brides! Using flowers to indicate the aisle works really well for outdoor weddings, where a fabric or paper aisle runner wouldn’t hold up on soft ground. If you decide to use flowers to create a design as your aisle runner, make sure you rope off the center aisle and usher guests into their seats from the other sides. You also want to make sure your photographer has a chance to capture the design before the procession! Using lights can help illuminate the path for a wedding held at dusk or can add a romantic element to the aisle runner. Some examples include rope lights, white string lights wrapped in fabric or even candles. We also love the idea of lanterns down the aisle. Just remember to enclose your candles in glass to prevent guests from knocking over a candle or the wind from blowing them out. We also LOVE this gobo (or light projection) on the floor as an aisle runner! Fabric aisle runners can add fun designs, colors and even a monogram to your ceremony. From burlap to lace, it is easy to find one (or make one) that will fit with the theme of your wedding. If you have an outdoor wedding, remember to make sure to put hard flooring under the aisle or have the ceremony on harder ground – you want to prevent anyone from tripping on the runner with their heels! Looking for an aisle runner that is really customized? This DIY aisle tells the couple’s story, complete with pictures and a corresponding puzzle in the program for the guests! Bonus: How cool is this idea of non-traditional seating for a ceremony? This would work perfectly for an intimate wedding! Looking for a few more ideas? Visit the Walk This Way board on Pinterest by TheMarriedApp or visit the photo galleries on www.HelloProductions.com!